In one of my weekly (geekly?) “holy cow!” epiphany moments, I came across this gorgeous specimen from the Brooklyn Museum of Art by Joyce Kozloff. Not only do I love the work of Kozloff because she was a pioneering feminist artist, but especially because of the complex compositions. Let’s just say I would not have the patience to produce paintings of this intricacy. The Feminist Art Movement of the 1970s helped expose a broad gamut of styles of women artists in the male-dominated art world. 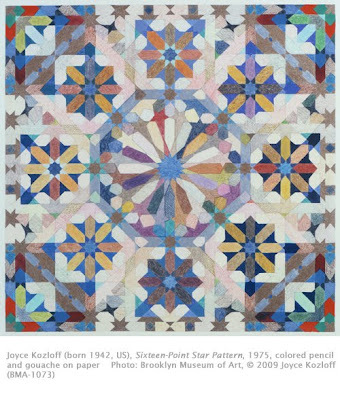 In a sense, Kozloff was a pioneer among pioneers in her insistence on the integrity of traditional women’s aesthetics (such as quilting, embroidery, and ceramics). She was also largely responsible for removing the stigma from the Pattern and Decoration movement within the Feminist Art Movement. One idea to emerge in the Feminist Art Movement was the inherent differences in form between the art of men and women. Many women sought to identify the formal qualities found universally in women’s art that had been suppressed or denigrated by the male-dominated art establishment. Some of these qualities included emphasis on line and detail, sensuous surfaces and forms, collage, grid, and patchwork. Kozloff was born in New Jersey. Her earliest works were Hard Edge Minimalism, which she ultimately found unsatisfying. A trip to Mexico in 1973 exposed her to the intricate stone mosaic of ancient Mexican ruins and the elaborate decoration of Mexican Baroque churches. She eventually transferred her interest from Mexican architecture to the ceramic tile decoration of Islamic architecture. Sixteen-Point Star Pattern graphically demonstrates this influence in patterns that one can easily imagine seeing on buildings in Isfahan, Iran or in the Islamic buildings in Spain. Kozloff’s paintings, such as this one, contain influences from three then-concurrent painting styles: Hard Edge, Color Field, and Decoration. She retained the structure of Hard Edge, enhancing it with abstract patterns placed within a grid of various small color fields. When she worked, Kozloff first meticulously established the grid and designs of the patterns. Since the 1990s Kozloff’s work has been inspired by close-ups of antique maps, often applied to non-flat surfaces. In the 1970s, Kozloff’s emphasis on pattern was one of the elements that helped break down the traditional barriers between fine arts and decorative arts. It was a period when Fiber Arts came into their own. The distinction between fine and decorative arts has more or less been minimized since the 1970s. DCMoore Gallery has selected works of Kozloff’s current work.